Before the fast food takeover. Hinsch’s was one of the soda fountain mainstays of Bay Ridge in my youth, which is to say, the Swinging Sixties and Super Seventies. Much like today’s Dairy Queen franchise, Hinsch’s, on 5th Avenue between 85th and 86th Streets, served simple lunch fare in addition to its ice cream franchise. The fountain specialized in cherry smashes (cherry syrup with seltzer) egg creams (seltzer mixed with milk and chocolate syrup) and ice cream and waffles. And, like the present-day Eddie’s of Forest Hills, Hinsch’s made its own brands of ice cream and boxed candy. Hinsch’s, no doubt, kept the local dentists quite busy, including mine, Dr. Leon Tempkin, whose office I still patronize (with his former partner and now successor, Dr. Mark De Bock). Hinch’s was originally Riechert’s Tea Room when it opened in 1931 at 8518 5th Avenue, in a brick walkup apartment building with businesses on the ground floor that was constructed in 1921. Reichert’s, despite the name, was an ice cream and candy parlor and did not serve lunch. It was in the 1930s that the first electric neon signs were placed above the business, which was purchased by Bay Ridger Herman Hinsch in 1948; it was he who changed the classic neon signs to reflect the new name, and these signs would remain in place for over six decades. Hinsch added hot lunches to the menu, and it was this iteration my parents discovered upon moving to Bay Ridge in 1955, with me following two years after that. Herman Hinsch owned the shop for a relatively short time. He sold it to the Logue family in 1961, which operated it until 2011; it was sold to Mike Moudatsos, who operated it as Mike’s Hinsch, with an accompanying adjustment in the neon signs. After four years, Mike’s Hinsch became a Stewart’s franchise and the neon was gone. 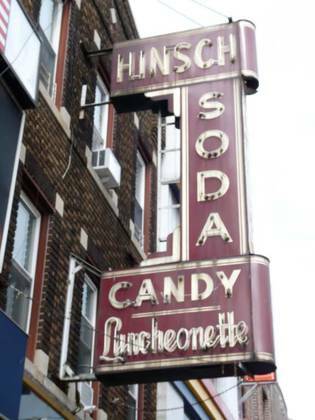 Hinsch’s was far from the only ice cream/luncheonette game in town. There was a competitor just two blocks away, Pohl’s, which was in a storefront behind the tree in this Street View photo. This was just a block from my home, and I found myself in here with my mother or grandmother rather more often than Hinsch’s. The atmosphere was somewhat sleepier, with dim, ambient lighting. Pohl’s disappeared in the 1970s and seems little mourned. Our family also purchased a great deal of Howard Johnson-brand ice cream from our butcher shop, which had a frozen food section, and we also hit the Karl Droge at 6th Avenue and 66th Street on outings in Lief Ericson Park for soft vanilla in cones, as well as the local Carvel. 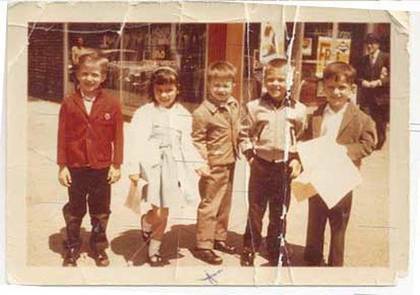 Here’s a photo of me (in brown, center) with some first-grade classmates at St. Anselm’s School at that very same corner in 1963. I got off to a lucky start with the ladies back then. 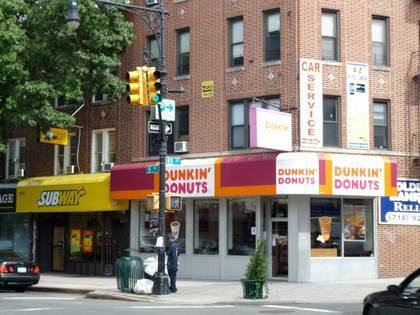 In the 1960s, The Dunkin Donuts at 5th Avenue and 85th Street was home to a kosher restaurant called Mindy’s, the name quite similar to the current kosher franchise Mendy’s, though I doubt there is a connection. In addition to my father’s duties as a custodian in Stuyvesant Town, he also made some money on the side taking care of this building. He was friendly with one of the tenants, Mrs. Reilly, and hence he always referred to the place as Reilly’s. In my teen years, I would be called upon to help out, which included emptying the dumbwaiter, which was still working into the mid-70s; I would don a pair of gloves and pull ropes to get the dumbwaiter, loaded with Hefty bags, and deposit them onto the curb. Across the street was a Carvel franchise and the local 68th police precinct, but both were razed in the mid-1970s when a new municipal parking garage was constructed. Saturdays was both our vacuuming and shopping days, with the old man taking control of the cleaning. 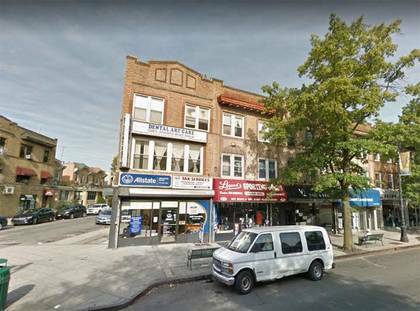 Then we would all pack off to 86th Street, mainly to the Century store (later Century 21), the hardware store called Birnbaum’s, the Key Food, and the butcher and poultry store, which were separate businesses on 86th Street near 4th Avenue. My parents knew their proprietors by name each week when they arrived to purchase that week’s comestibles. Then, it was off to lunch, most often at a place called the Green Tea Room (to this day I don’t remember if the tea was green, or the room), Hinsch’s, or after it was built, the Tiffany Diner on 4th Avenue and 99th Street, which often required a ride on the B-63 bus. I patronized the Tiffany until the late 1970s, until I stopped. An incident sticks in my mind. There was a gathering at my house, pretty much drinking beer and shooting the breeze (those who wanted to smoke weed repaired to the triangle park across the street from my house) and one morning around 6 we decided to have breakfast. Off we went to the Tiffany Diner. One of us, Stan Evans, was African American. We sat there a good 20 minutes before one of us got fed up and had the waiter come over. I did not go into the place again for nearly 20 years. Soon after that it closed and it’s now a TD Bank. When I’m in the area, I head for the Narrows Coffee Shop on 4th and 100th. The nexus of 5th Avenue and 86th Street is Franchise City these days, and you can’t swing a dead cat without hitting a Dunkin’ Donuts, Popeyes, Burger King, or McDonald's (which would require a fairly good heave of the feline). But in the 1960s, we knew where to buy food and we knew who sold it by name.